Set on the top floor of a historic building, this apartment offers panoramic views of Siena's historic center. The building is located near the Artemio Franchi stadium and Piazza Gramsci, a central bus stop. Piazza del Campo is a five minute walk and the train station is easily reachable by bus. Guests traveling by car can load/unload luggage at the nearest parking area, 200 metres away. The apartment is classically decorated, and includes a dining room with fridge, dishwasher, and fully equipped kitchenette. Finished in high quality materials and recently renovated, this top floor apartment provides a perfect opportunity to visit Siena and its surroundings. Natural gas and electricity are to be paid extra locally for stays of 3 days or more. Conveniently located, good size, lovely view. Great apartment with a great view! The apartment was well located to the train station and the sights of Siena. It is clean and well-equipped with most things needed. There's no lift, so the 95 stairs might be difficult for some, but for us, it only justified the pasta and gelato! The view of the city from up here was incredible. Ennio was very helpful getting us set up in the apartment and made recommendations for restaurants and things to do. We would stay here again if we return to Siena. Good value in the heart of the historic city. More utensils in the kitchen--second skillet, mixing bowels, a coffee pot in addition to French press--would be helpful. 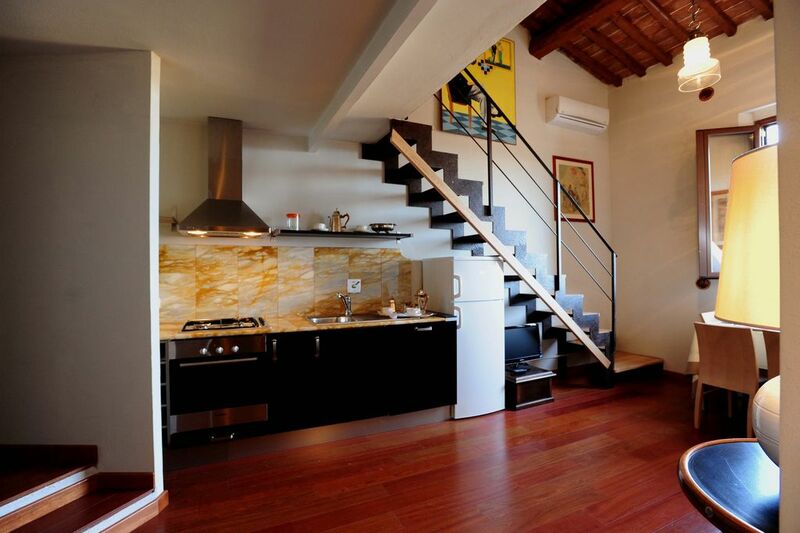 This apartment is perfect for a small family visiting Siena. We connected with Ennio easily, he showed us everything we needed to enjoy the apartment. Beds were fine, as were bathrooms. Location was very convenient for city center, but not noisy at all. We loved it! Caution: the apartment is on the 3rd (4th) floor and there is no elevator, so be prepared to climb stairs. Wonderful! Great location, in a quiet part of the historic center close to everything. Clean , well equipped, great views, and air- conditioned. One caveat..96 steps up from the street to the front door. We stayed in Siena for 8 nights and overall, this was a great apartment. We travel with 2 young children (1.5 and 4.5 yrs old) so we are quite particular about where we stay. The apartment is two levels: upstairs there is a bedroom that overlooks the kitchen/living area and bathroom, and downstairs, there is an enclosed bedroom, bathroom, kitchen and living area. The kitchen has an oven, stovetop and refrigerator (no microwave). There is also a washing machine but no dryer; however a clothes drying rack is provided and it was good enough for us (and bring liquid detergent). The table seats four and there is a couch as well. There is a television in the seating area and free wifi is available. The rooms could be made pretty dark as the shutters blocked out a lot of light (great for our kids at nap time). The apartment is on the fourth floor; our 1.5 year old now can climb stairs all by herself! It's not a bad climb at all and you won't find many apartments in Italy with elevators anyway. The apartment is about 15 mins away from the main square (Il Campo) which was perfect for us since we didn't want to be in a loud surrounding. There is a grocery store (Conad) less than 10 mins away which had everything we needed. There are many restaurants nearby too. Parking is a bit difficult though if you have a rental car. However, you can park outside the city walls for free. Eliza, the property manager, was so nice and helpful. The airline lost one of our suitcases and she was able to receive it for us the next day and deliver it to us. She checked up on us by email to make sure we were doing well and ensured that the apartment had everything we needed. Cleaning is available for an additional cost. Garbage is collected Monday to Saturday outside the apartment building. We would recommend this apartment to families who are looking for a convenient place to stay that is quiet and well kept. The property owner also has a few other units available that are smaller. Thank you Eliza for making our stay a wonderful one.